Yesterday, His Majesty the Fourth Druk Gyalpo and members of the Royal Family took part in the consecration ceremony at the completion of major rehabilitation carried out at Dechenphug. The rehabilitation was commanded by His Majesty Jigme Singye Wangchuck, the greatest Dharma King in the world. I was barely 5 years old when my mother introduced me to Ap Gyengye in Dechenphug Monastery. Since then I’ve visited Dechenphug several times a year to honour Him and to offer prayers for His support. 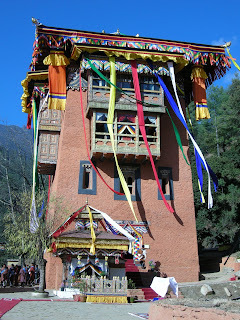 And during the last four decades I’ve seen increasing numbers of people make the pilgrimage to Dechenphug. Ap Gyengye has served our King, our country, and our people exceptionally well. And our sacred relationship continues to flourish. Gyengye Jagpa Milen Kheno!